It is a method that channels universal spiritual energy of Reiki and transmit it by touching. Reiki method is simple to apply and very effective. ​It can be applied as self treatment and also as treatment to our family members, our friends, and by professionals as an alternative therapy. Nowadays, millions of people around the world use Reiki method in their daily lives, improving their inner and outer reality. Reiki means Spiritual Energy literally but also can be interpreted as Universal Energy, Heavenly Energy or Higher Energy and it has specific qualities. Reiki energy nature is characterized by wisdom, insight, reformation, harmonization and healing. Reiki wisdom appears as an independent higher "intelligence" because after it is channeled to recipient body and energy field, Reiki energy seems to "know" where is the problem that needs to be healed. Therefore Reiki is not affected by beliefs of the person who channels it or the person who receives it. Reiki is a Japanese word and constitutes from two Japanese logograms (kanji), Rei and Ki and means spiritual energy. Ki 氣 : energy (literally air or steam). 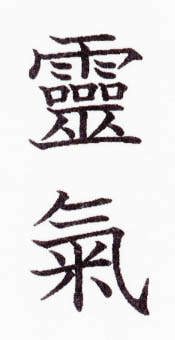 Ryoho is a Japanese word and constitutes from two Japanese logograms (kanji), Ryo and Ho and means healing method, healing system or healing technique.